Siemens has added the WinCC/SES (sequence execution system) option to its Simatic WinCC Scada (supervisory control and data acquisition) system for the sequential control of recipe-based and sequence-based operations in production plants. Such an addition is ideally suited to plants for which dosing, mixing and material transport are important process steps, such as in the food and beverage industry. Thanks to the flexible sequential control, plant operators are able to define their production steps clearly and freely combine them into individual process sequences. Both step sequences and parameters can be adapted online at any time to meet ongoing production requirements. This means that production sequences can be re-adjusted quickly and simply in the event that the quality of natural raw materials fluctuates or if another sequence of production steps is necessary to enable flexible routing through the production system. In addition, Simatic WinCC/SES V7.3 offers a high level of system availability and rapid response times by virtue of the fact that the programmes run directly on the automation controller as opposed to on a PC. Simatic WinCC/SES is used in production plants involving dosing, mixing and material transport where raw materials stored in tanks, silos or containers have to be combined in reaction vessels and processing machinery in a precise order across several processing steps to yield the end product. Using Simatic WinCC/SES, plant operators can define production steps for their production units, specify production parameters, such as setpoints, and determine the production processes in the form of step sequences. After production commences, all the steps and production parameters, such as the setpoints, actual values, and current status of the production sequence, are clearly displayed in an overview. Operators can also intervene manually in the production process and change the sequence order during operation, for example, or stop, jump back or move forward within the sequence. WinCC is designed on a non-technology-and industry-specific basis, it is modular and one can extend it in a flexible way. “WinCC makes possible both demanding single-user applications in mechanical engineering as well as complex multi-user solutions or even distributed systems including several servers and clients - also internet-based - in plant visualisation,” Siemens explained. A large number of WinCC options and add-ons allows industry-specific solutions, for example in pharmaceutical industry or water treatment applications. 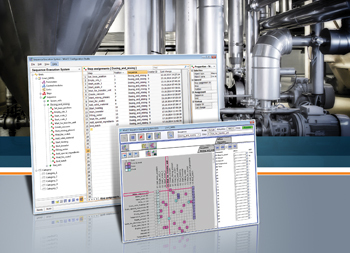 Siemens’ Scada system offers maximum functionality and a user-friendly user interface.